It is healthy to reach out to others as you mourn but don't feel obligated to accept the unhelpful responses you may receive from people. You are the one who is grieving and you have certain "rights" no one should try to take away. The following list is intended to empower you to heal and to help you decide how which responses from people are not helpful. This is not to discourage you from reaching out to others for help, but rather to assist you in distinguishing useful responses from hurtful ones. No one grieves in exactly the same way. When turning to others for help, don't allow them to tell what you should or should not be feeling. Talking about grief greatly aids in the healing process. Communicate with friends and family who will allow you to talk as much as you want, as often as you want, about your grief. If at times you don't feel like talking, you also have the right to be silent. Confusion, disorientation, fear, guilt and relief are just a few of the emotions you might feel as part of the grieving journey. Some may try to tell you how to feel, this is wrong. Don't take these judgmental responses to heart. Instead, find listeners who will accept you and your feelings unconditionally. This difficult time will most likely leave you feeling fatigued. Respect what your body and mind are telling you. Get daily rest. Eat well-balanced meals. Don't allow others to push you into doing things you don't feel ready to do. Sometimes a powerful surge of feelings may overcome you. This can be frightening, but is normal and natural. Find someone who understands and will let you talk it out. The funeral ritual does more than acknowledge the demise of someone loved. It helps provide you with the support from caring family and friends. 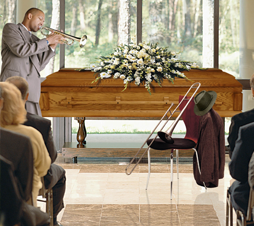 More importantly, the funeral is a way for you to mourn. If others tell you the funeral or other healing rituals such as these are silly or unnecessary, don't listen. If faith is a part of your life, express it in ways that seem appropriate to you. Allow yourself to be around people who understand and support your religious beliefs. If you feel angry at God, find someone to talk with who won't be critical of your feelings of loss and devastation. You may find yourself asking, Why did he / she pass away? Why this way? Why now? Some of your questions may have answers, others may not. Watch out for clichéd responses from people. Comments like, "It was God's will" or "Think of what you have to be thankful for" are not helpful and you do not have to accept them. You have the right to right to treasure your memories. Memories are one of the best legacies that exist after the demise of a loved one. You will always remember. Instead of ignoring your memories, find others with whom you can share them. Reconciling your grief will not happen quickly. Remember, grief is a process, not an event. Be patient and tolerant with yourself and avoid people who are impatient and intolerant with you. The death of someone loved changes your life forever.